To my friends both in the northern and southern hemisphere, some thoughts about the weather. All quotations from BrainyQuotes. The forecast: Spring will come! 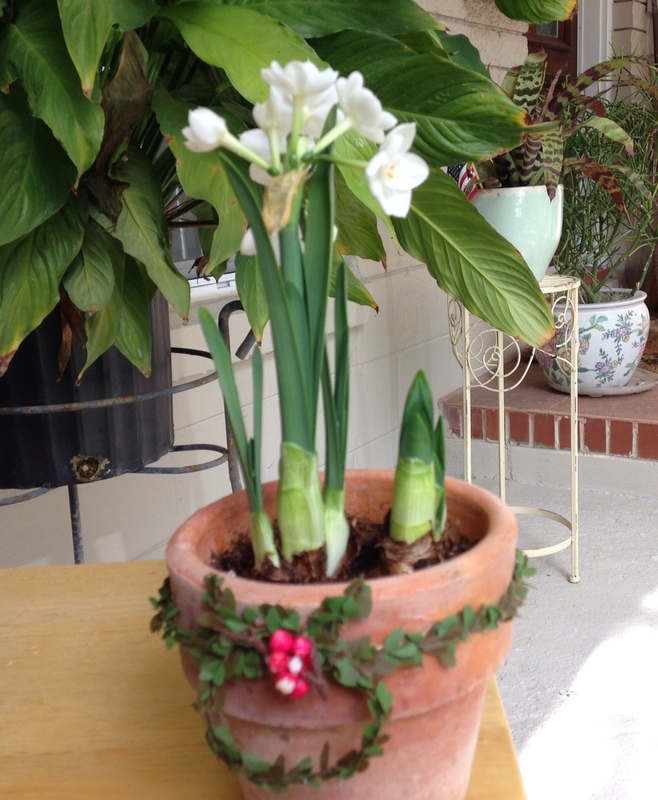 Paperwhites from the narcissus family, with their “delicate color and sweet, musky fragrance,” a forecast of spring to come. I’m guessing you agree with some quotes more than others. One or two you may completely disagree with. Can you add another one? We’ll be listening . . .
Coming next: Wanda: Boring in Beige or Beautiful in Blue? 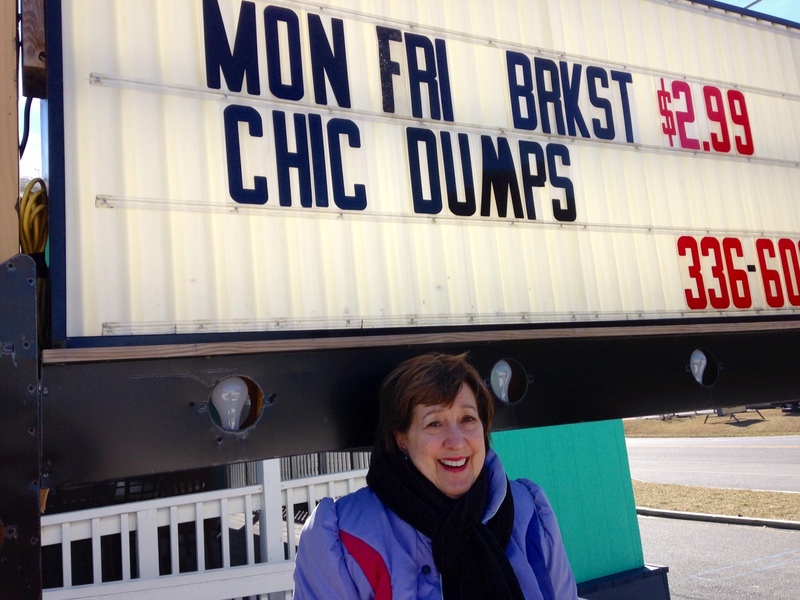 Actually, we did not patronize this restaurant, but were drawn to the tacky marquee ad. It may have served to give one of us the germ of an idea to label our group the Cinco Chinco Chiques. For certain, it was cold and windy! That\’s my memory of pausing for this shot. Great addition, Liz. I can hear Pooh sing-song-ing these lines in the movie too. Oh, the bliss of this simple monologue! Cold weather for us southern chicks calls for a cozy afternoon with comforters, coffee, chocolate and a comedy surrounded by a crackling fireplace. \”Oh, the weather outside is frightful, but the fire is so delightful.\” Enduring friendships survive in any kind of weather. Blessed. Lovely alliteration and a good reminiscence from Christmas, Carolyn. I doubt that our northern friends, weary of the snow, would share our enthusiasm, but they would certainly agree with your conclusion about friendship. Thanks! Marian, that sign is a hoot! But regarding weather, Daddy used to say when someone made a dire prediction about the weather, \”What do you think we should do about it,\” and they\’d respond with a hem and a haw, uncertain what to say, but his standard comeback then was \”We\’ll do absolutely nothing about it.\” 🙂 Yea, we groaned about that eventually. Anyway, that also reminds me of my family\’s only visit to Chincoteague when Dad was in a wheelchair and we had 3 little ones under age of 6. Mom and Dad came to Virginia for a visit and we spent a couple days there. We tried to go out for ice cream to a place where there was NO handicapped access at all for Dad (not unusual) and then another place, a nice dinner place, that had a pointed sign, \”No children under the age of 6\” or something like that. I don\’t remember the specific age or wording but it was clear they didn\’t want kids ruining anyone else\’s dining. Which I get, but putting the two things together, we felt less than welcome. I became so much more aware of the big issue of access through my Dad\’s aging process. But we had a great time anyway at the beach, with a mini cruise, and seeing the ponies. I\’d love to go back. I had barely heard of Chincoteague before this trip, and I see you have mixed memories of this place. Since your visit, laws have been changed to accommodate handicapped persons who certainly deserve the right to enjoy a nice family dinner. Age discrimination too is a thing of the past when it comes to dining. Thanks for your entertaining stories as always, Melodie. \”Oh, the weather outside is frightful, but the snow is so delightful!\” I\’ve been trying to come up with a clever quotation about the weather, but this is all I can come up with! I\’m a four seasons gal, I love all four seasons, which is good since I love in Michigan! I love the crispness of the air on a cold winter day! In fact, I like it much better then a stifling hot day in summer! One part of the weather, I don\’t like, in any season, is wind! I don\’t enjoy a windy day. The toughest season for me is early spring when the seasons can\’t seem to let go of winter and turn to spring. I enjoyed the quotes in your post and especially the pictures. Thanks for sharing! I wonder whether you live close to the Windy City in Michigan. Our children used to live there, and I remember the biting, cold wind in the winter. I do envy you the four seasons though with the ravishing colors. We have to look hard for a little russet and gold in Jacksonville, usually in December. Glad you enjoyed the quotes, Anita. Hi Marian, I\’m a little confused…the only city I know of called The Windy City is Chicago. But anyway, we live in Michigan, in the middle of the mitten! Autumn is my favorite season of all. That\’s okay. I get mixed up, more times than I want to admit! Well, I had to look up a quote Marian – not one came immediately to mind. Enjoyed this run around looking for quotes but I think you got the best of \’em! Thank you! Leave to George Carlin for the wit. Thanks for adding his famous quote, Susan. Unless you live in Alaska or thereabouts, there is plenty of dark even on summer nights. Marian — My love the quote you shared: \”Wherever you go, no matter what the weather, always bring your own sunshine,\” by Anthony J. D’Angelo. It\’s obvious you get your quips and cleverness from that Mother of yours. The pitch forks and little green frogs phrase reminds me of something else you said a while ago, but unrelated to weather: \”Slower than a herd of turtles in a jar of peanut butter.\” Those metaphors! Thanks, Laurie. Nothing like an old, familiar title to make the tune pop into my head. Etta James is the artist I like best for \”Stormy Weather,\” and Lena Horne is right up there with her. And remember when \”Raindrops Keep Fallin\’ on my Head\” was popular in the 1970s? Being hit by the stray end of the Polar Vortex this week made me think of weather as an appropriate topic for February. And there isn\’t much we can do about it. Thanks, Judy. \”It snows!\” cried the schoolboys. This was the line that came from my maternal side, and it came from some poet. Love you hodge podge of purple quotes and signs. Thank you for commenting here, Dolores. I\’ll take that as a compliment. I did an online search for your quote, but came up empty-handed. Let\’s just say it stands as truth for much of the country right now. I\’m guessing where you live, like Florida, has escaped the snow. Perhaps a pity! No snow here; no rain either. Sounds like a perfect day to enjoy being outside, Delores – I\’m going for a walk, no sweater, no coat. But the weatherman says tomorrow I\’ll need an umbrella. I like the jolly sounds in the quote you posted, especially the words huff, wellies, brolly, and foggy. Weather generates some picturesque sounds. Thanks, Cherry! Some of my most prized possessions now are notes and letters from my Grandma and Mother who have passed on. I know you love being in Spain, still your Canadian links keep old friendships alive and well. I\’m guessing you have an international phone plan. Then too there\’s always Skype! Skype is great. Last night I Skyped with a dear friend and I Skype with my daughter a lot. Thank you for visiting my blog today and commenting too. I enjoyed poking around in your blog, noticing we have a lot in common. Your recent post featured Enchanted April, a film I have seen at least twice. Take heart, you can stay snuggly in New Jersey knowing that some enchanted April days will arrive right on schedule. Come back soon, timeless lady! No matter what the weather – your camera lens captures it beautifully! Marian … loved this, but I am still glad to be in the Antipodes, where the temperature has been an unseasonably cool … varying mostly between 60 (early morning) and 85 (mid afternoon). The exception was a 2 day heat wave in Ayers Rock, at a blistering 106 degrees. I have been following your travel (more like an expedition perhaps) on Facebook. Certainly you are journaling and may reveal more of your impressions on future posts. I remember how hard it was to keep a diary as we traveled, but how glad I am that I have the written record. Details just fly away if you don\’t write them down. By the way, I love the word \”Antipodes.\” It just rolls so gracefully over the tongue. Safe travels, you two!